Print beds come in many different sizes, are made of different materials, and are used for printing with different materials. When you first get started in 3D printing, you will probably start off printing with PLA. PLA is a thermoplastic created from processing plant products such as corn. More on PLA and ABS in future posts. One advantage to printing with PLA is that you can print it “cold.” This means you do not need a heated bed. As a beginner printer, I will focus on metal print beds rather than glass or specialty print surfaces such as PRINTinZ. An important piece of 3D printing is that you need to make sure your PLA is adhering to the print bed. While a metal print bed gives you a very flat surface, which is important, and can take a bit of a beating, PLA doesn’t adhere to it as well as some other materials. It turns out that 3M Original Blue Painters Tape provides a great surface that PLA will adhere to, and is a cheaper option than kapton tape. It is important to get the specific 3M Original Blue Painters Tape #2090. There are some good write-ups that people have done comparing multiple types of blue painters tape and the #2090 always wins. The links above are for a 1.88 inch wide version and a 6 inch wide version. The Printrbot Simple Metal I use has a 6x6x6 printing area. The 6 inch wide version would be perfect, and allows you to just put one strip on. However, the cost is quite high. I chose to go with the 1.88 inch wide version. Since my print area width is 6 inches, I have to lay down 4 strips to get full coverage. This takes a bit more time, but saved me a few bucks up front. After laying down your tape, you need to make sure there are no air bubbles under it. You can use a credit card, or a nice plastic putty knife. The plastic putty knife will also come in handy for removing your prints after they have finished printing. Just put the putty knife at an angle and drag it across the tape. When I first started printing I thought that just having the tape was good enough, and for very small prints I had no problems. Then I started my first larger sized print that was going to take over 2 hours. Well, being the Newb that I was, I didn’t realize that there is still a good chance of warping. You can see a picture of warping on my print below. 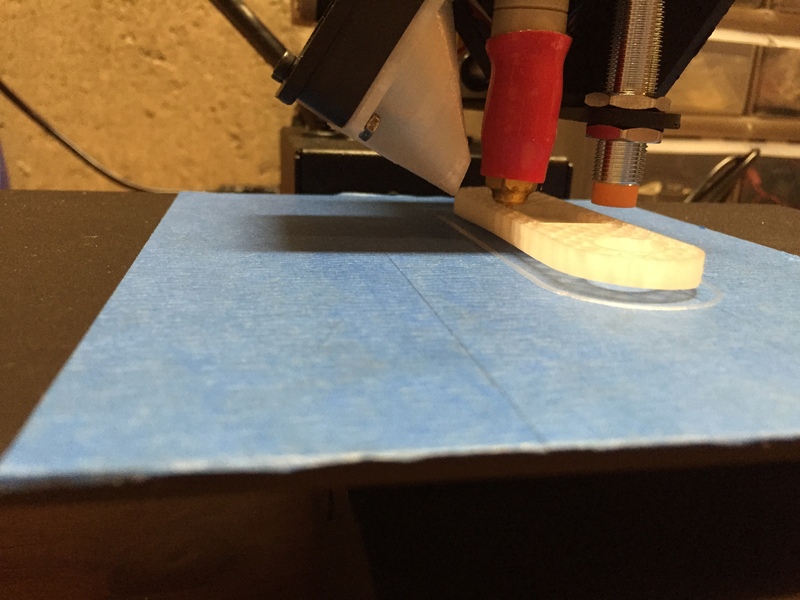 Warping is when a bottom edge of the print starts to pull away from the bed. My print got so bad that the entire print came off the bed and I had to cancel the job an hour into it. There are two solutions to this. Hair Spray or a Glue Stick. I use hair spray as it was easy for me to grab a bottle from my wife. Important note here, do not directly spray at the print bed as it will get all over the place and create the need to clean sticky hair spray off your printer and work area. Take a paper towel, fold it a few times, and then put the nozzle of the hair spray very close to the paper towel and spray. You can then rub the paper towel on the painters tape. Ever since I have started using the hair spray method, I have had no problems with warping. Any comments, or other suggestions, leave a comment! Happy 3D Printing!